(i) What is a hurricane? They are low pressure weather systems which have very strong sustained winds over 120km/h are bring torrential rainfall. Cyclones, typhoons and hurricanes are all names for the same weather event. (ii) How do hurricanes form? Firstly, for hurricane to develop certain conditions are needed e.g. sea temperatures over 27°, wind speeds need to be constant at ground level and at 12km above ground level and it needs to be in the trade wind belt between latitudes of 5° and 20°. In low pressure conditions, the air draws in the water vapour from sea. As the air rises, it spirals up. By the time the hurricane gets to land there is air still spiralling upwards. However, the air which has already reached the top has cooled and condensed and this is what causes the torrential rainfall. Further, for hurricanes to occur wind speed is already relatively medium to high and the upward spirally of unstable warm air causes the wind speed to increase. They form because during spring and summer there is an imbalance between atmospheric heat and the Earth’s heat energy. They form because the sun heats the upper portion of the ocean and a lot of heat energy builds up as a result of it. To remove this amount of heat energy, condensation takes place in the atmosphere. (iv) Where are hurricanes usually found? They occur around equatorial countries and are created in oceans in the equatorial region for example; the Gulf of Mexico, the Bay of Bengal and the Indian Ocean. (i) How can we measure the magnitude of a hurricane? They are measured through a Saffir-Simpson scale where the rating of a hurricanes is based on wind speed, storm surge (rise in sea level because of low pressure and strong winds) and damage. See table above. (ii) How can we predict hurricanes? (i) What is the location, date and any crucial facts of the hurricane? (ii) What were the causes? (a)Hurricanes have always occurred and are a way of nature balancing heat. (b)The city of New Orleans is below sea level; it survives by having levees and flood walls at each side of the city. (a) Well global warming is causing sea levels to rise which makes it easier for hurricanes to form and reach high intensities is one theoretical cause. (b) Due to the construction of levees wetlands which were one form of natural defence against hurricanes are disappearing at 25 square miles per year! Something to think about: should the New Orleans have grown to the size it did in such a perilous location. Added to that the fact that the levees have not been maintained properly. (c)Every aspect of life was disrupted; people lost jobs, financial securities, families and health. (e) There were many health concerns due to lack of clean water, food and toilet facilities. (f) 600,000 pets were either killed or stranded in the disaster. (a)Everyone became unemployed; people lost so much of their financial stability that the government wasn’t able to collect taxes. (b)In 2006, it was calculated that the cost of repair and reconstruction was $10.5bn. (c)Total economic impact was over $150bn. (d) Oil and gas production was affected hence prices of these resources and joint goods e.g. petrol rose in price too. (a)There was a significant damage to forestry. (b) The city incurred severe flooding; it was so bad that by the 31st August 80% of the city was underwater. (c)Almost all infrastructure was destroyed. (d)Levees and flood-walls protecting the New Orleans breached. (iv) How was the hurricane managed: what were the responses? (a) People were instructed to evacuate. (b) Within a year levees were repaired. (c) Temporary floodgates and pumps were put around four main canal entrances to prevent further flooding and damage. (d) Weirs (low-head dams) were put in place to regulate the flow of the Mississippi River Gulf Outlet (which is a river which comes from the Gulf of Mexico). (e)Wetlands are being restored as a natural form of protection from future hurricanes. (f) Improvements are continually being made to preparation plans e.g. more education is given in schools, awareness weeks happen once a year etc. Coast 2050 is a $14bn , 30-year scheme to help protect the area. It includes flood controls, water diversion and coastal restoration. Through this the government will create more marsh land and set up many other defence systems. (v) Who were the key players involved? The heatwave was unanticipated, chaotic and unexpected. Heatwaves can be seen as shorter versions of droughts. The heatwave was considered an extreme weather event . It was caused by unusually high pressure conditions. What makes this case study interesting is that the question lies was this a first taster of climate change of was it part of nature’s cycle? What happened in a nutshell? Europe experienced a prolonged summer anticyclone. The hot and dry conditions caused problems with levels of water, crop production and the health of the young and elderly. The highest temperatures were seen in the urban heat islands; they are where the most carbon is emitted and overland runoff is experienced. These factors help conditions become more severe. It is important to recognise that though humans didn’t contribute much to the causes they sure made things a lot worse with global warming and much more. The tropical continental air mass brought in an anticyclone. [In a summer anticyclone we experience clear settled conditions which can lead to long sunny days and warm temperatures.Weather is normally dry, but occasionally very hot temperatures can lead to thunderstorms.] Pressure became as high as 1030mb. In an urban heat island the area does not cool through evopotranspiration. The prolonged time period was created by a blocking high. The high pressure stuck over the UK and the normal tracks of depressions had changed. This meant that some other parts of the world experienced more depressions than usual. Human death toll exceeded 30,000 due to aliments such as dehydration. Nuclear plants had to shut down as cooling process was impossible because the water levels were extremely low. Public water supplies were at dangerously low levels. Hydro-electric power became near to impossible to use. The London Eye was forced to close one day as it became dangerously hot within cabins. Farmer’s livestock and crops died and it cost them nearly £7 million. As a result food prices rose which meant the poor were eating and drinking less. Demand for electricity increased because of increased use of air conditioning systems and other cooling devices. Tourism in parts of UK increased helping the local economy. Transport/infrastructure suffered e.g. trains derailed and road surfaces melted therefore the government had to increase spending in this section. Fires broke out in forests in Europe destroying habitats and important vegetation. Furthermore, it had cost Portugal (which was affected worst by this) 1 billion euros. Total glacier volume loss in the alps was 5-10% in 2003. The Danube river in Serbia was at its lowest level ever in about 100 years. Increase the number of medical staff on site to treat illnesses caused by the hot weather. Extra ice cream vans were brought in to help the tourists to cool off in the hot weather. Extinguish forest fires and evacuate people who live nearby to protect people. Encourage people to visit elderly friends, relatives and neighbours to check they are coping in the heatwave. Give people advice on the tv/newspaper on the best ways to cope with effects of the heat. Bring in extra emergency refrigeration units to store large numbers of dead bodies. There was a temporary ban on hose pipe usages throughout Europe. If temperatures reached over 30° then trains and other motor vehicles would have to comply with further speed restrictions. Some people changed there working hours to make their job more bearable so for example garbage collectors worked earlier in the morning when temperatures were lower rather than in the afternoon. Reduce carbon dioxide emissions which contribute to climate change. Install air-conditioning and alert-call systems in homes for the elderly. Build desalination plants to help increase public water supplies. Improve seasonal weather forecasts and climate predictions to help plan for future summer hot weather. France; The French incurred the biggest temperature increase. Some places in France saw an over 9 degrees rise whereas in the UK- maximum it was a 6 degrees rise. Long period of rainfall shortage. Fact: Over a long time, Australia has three good rainfall years and three bad rainfall years out of ten. In El Nino years trade winds reverse, this caused Australia to experience very high pressure. The moist arm had been felts by South America which usually would have come to Australia. This change between normal years and El Nino years is called the Southern Oscillation Index. Some scientist believe climate change is behind intensifying and prolonging the El Nino experience. Evidence that is was the driest and warmest year (2002) in Australia has been collated. The rural suicide rate soared. Legislation was implemented e.g. car washing bans and 4-minute-long showers. Prices of energy soared. Water bills were expected to rise by 20% in 2008. Government spending increased to help farmers and small businesses cope with this scarcity. Loss of vegetation, wildlife, biodiversity alongside soil erosion. Water quality declined and there was toxic algal outbreaks in depleted rivers, dams and lakes. The government announced a $10 billion national water management plan in 2007. It will build on work under two other organisations; the Living Murray Initiative and Australian Government water fund. Lake Brewster Water Efficiency Project- it aims to improve Lake Brewster for storage on the Lachlan River in New South Wales. (building an embankment to split the lake, deepening of the channel, creation of 2 wetlands). Numerous water smart projects involving smart technologies are being discussed including the Lake Brewster Water Efficient Project. The government is going to control water usage – minimising the water usage in agriculture. Modernising irrigation methods – adapting more accurate water meters to improve measurement and reduce over- watering and piping and lining channels to make watering methods efficient. Addressing over-allocation- areas which are not viable e.g. salt-affected areas will be classed as retired and many farmers will be given support to leave the industry. Reformation will take place to ensure accurate and precise equipment is available to monitor and forecast water levels. A national database will also be created to report water usage. Key ecosystems, indigenous people and communities will be identified and it will be examined whether the MDB can meet and sustain the needs of these communities. Research and development from The Australia Commonwealth Scientific and Industrial Research Organisation (CSIRO) has been key in introducing new technologies such as drought resistant plants to manage the drought, crop and pasture management technology for conserving water in different regions and Precision farming which uses technology to ensure farmers are making informed and sustainable decisions. GPS are being used to make sure seeds are planted accurately to make farming efficient. Can a winter anticyclone be classed as an extreme weather event? What are the weather conditions shown in this map? Firstly there is an winter anticyclone. The pressure is over 1000 (high pressure) and winds are blowing in a clockwise direction. There is also quite a large gap between isobars showing winds aren’t that high which fits in the model of a winter anticyclone. There will be hardly any clouds allowing the sun to shine through although the temperatures will still be low as there is a lack of clouds which allows heat to escape back into the atmosphere. We can see this through the symbols on the chart. The winter anticyclone has built up through cold and dry condition in Scandinavia and Eastern Europe. The Polar Continental air mass is the main one associated with this weather system. There is also a cold front passing through North East England and Scotland. Traditionally, in anticyclonic conditions we do not see fronts forming but it just goes to show that real weather is much more complex than what the textbook says. In this front the cold air advances and force the warm air to rise sharply. When the warm air rises quickly is condenses and causes a short rapid snap of heavy rain. Hence around the front we see symbols of rain. What is an extreme weather event? It is severe or unusual weather conditions e.g. hurricanes which cause severe impacts on the environment, people and economy. So what are the risks with this condition? Firstly, temperatures can become extremely low bringing many health risks like hypothermia especially to children and the elderly. Many who suffer with breathing difficulties will probably have many problems. This is because first off the air is cold and dry and secondly there is a high risk or fog which is known to making breathing difficulties bigger. Fog is difficult to forecast in these situations do to cloud cover or the lack of it! This makes forecasting difficult and when extreme anticyclonic conditions are arising it is hard to forecast hence hard to act appropriately. Some extreme situations see heavy snow of ice falling. As we have seen in the last too months this can cause severe disruption. Many lives are lost, over a million people are not able to reach work and livestock are dying as they are not able to cope with these cold conditions. Can a summer anticyclone be classed as an extreme weather event? 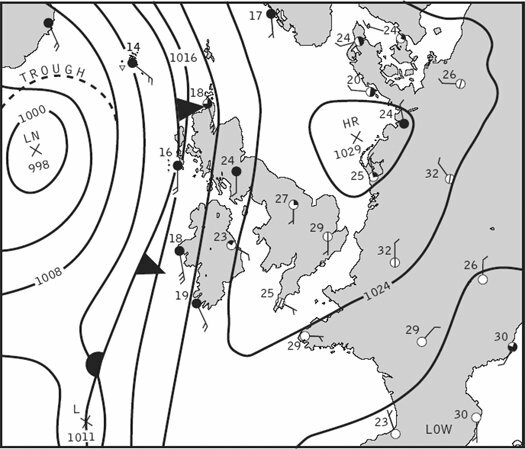 What are the weather conditions shown in this synoptic chart? It is showing a summer anticyclone. We can see high pressure (pressure over 1000) and clockwise winds. Typically in this conditions the air mass is Tropical Continental – warm and dry winds from places like the Sahara. We can see no rain as in summer anticyclones we do not see much cloud formation as it is high pressure.There are light winds over England and Eastern Europe – we can see this through the knots and gap between the isobars. However Scotland an Ireland have higher wind speeds and more cloud cover. There is also an occluded front passing over this part of the UK – traditionally we do not see front in anticyclonic conditions- but just goes to show the weather isn’t as simple as the textbook suggests. The occluded front occluded front occurs where a warm front and a cold front meets. the means the amount of warm air that rises is larger than just a warm or cold front. This means that in that area there will be a down pour of torrential rain possibly. It is severe or unusual weather conditions e.g. hurricanes which causes severe impacts on the environment, economy and people. So what are the risks associated with this weather system? As temperatures can become extremely high we will see many health risks of dehydration etc and this worst affects the elderly and the young. Water levels can become extremely low which means hydroelectric power and thermal power station may have to shut as the cooling process becomes impossible.This is dangerous because it is in a time when people will need Air conditioning in their homes. Once again there is a high risk of fog, which is hard to forecast, and this may cause breathing difficulties. Especially because pollution can get caught in sinking air causing smog – which is terrible for asthmatics. In extreme event ‘blocking highs’ can occur where the normal pattern of weather is diverted and we are stuck with the anticyclone for long periods of time. Can a depression be classed as an extreme weather event? Describe how the depression shown on this chart might produce extreme weather hazards. Firstly there is a depression. The pressure is below 1000mb (low pressure) and winds are blowing in an anti-clockwise direction. There is also quite a small gap between isobars showing winds are strong which fits in the model of a depression. There will be a large cloud cover as a depression is when warm air meets could air and this causes the warm air to cool resulting in precipitation. The depression has built up through cold and wet conditions in the Arctic Ocean. The Polar Maritime air mass is the main one associated with this weather system. There is also a cold front passing through South East of England. Traditionally, in low pressure conditions we see occluded fronts forming on the actual land but even if it is close there will still be torrential rain on land. In this front the cold air advances and force the warm air to rise sharply. The result of a cold front is a rapid period of torrential rain. Torrential rainfall can lead to river flooding which especially with cold fronts lead to flash floods. The can cause many adverse effects for example the Boscastle 2004 flash floods caused injuries, £2 million damage to buildings and roads and coastal pollution as debris and fuel from cars flowed out into the sea. In extreme situations could lead to a snowstorm or blizzard which as we saw in February 2009 causes disruptions and deaths. It could lead to high waves and surge may be destructive to the coast. In the case of flooding if sewage systems failed then they would be a risk of cholera and other disasters.